Cocoa and Lavender: Hello, Yellow! From the middle of February through the middle of April, everything seems to be yellow in the desert. 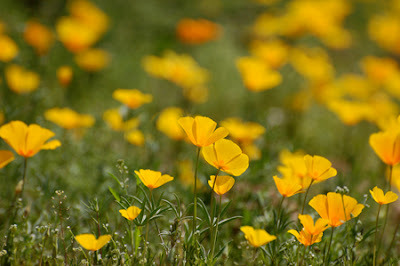 While other colors do appear – the bluebells are blue and the chuparosa are rosa, for sure – the Sonoran Desert is awash in a myriad of yellow blossoms that include acacia, Mexican poppies, brittle bush, senna and palo verde trees. Those are just the native plants – don't get me started on the non-native species! 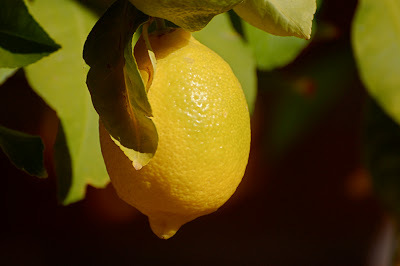 Veering towards today's topic... My favorite yellow item to pluck off a tree in my garden is a ripe, juicy lemon. Now mid-March, the lemons are coming in fast and furious. Recently, I have seen neighbors walking past the house with empty buckets only to walk back a few moments later with buckets full of the tart yellow fruit from other neighbors' trees. And I wonder about their culinary intentions. I have a litany of plans for our lemons – lemonade, tequila sours (a recipe thanks to friends in New Mexico), a citrus-almond cake (based on a Nigella Lawson recipe), Moroccan preserved Lemons, lemon brûlée tart, French lemon macarons, salad dressings, various pasta dishes, or a squeeze of its sweet, aromatic juice on a perfectly grilled steak – a practice I learned in Tuscany. And, while there is no need for comfort food now that the sun is brilliant and the days are longer and warm – even for Doreen in Portsmouth – I can't help gravitating back to my mother's lemon squares. And, of course, my mother got the recipe from a family friend who probably got it from another friend, another family. Who DID invent the lemon square? When I taste one, I ask myself, "Who cares?" All I know is that I am glad Mrs. P gave the recipe to Mom and that I still have it today. 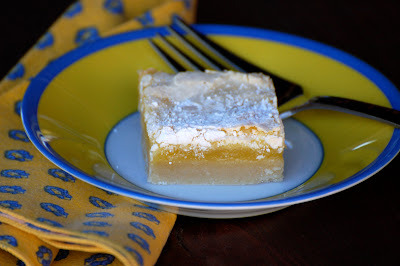 Because I need a batch of lemon squares – who doesn't? Preheat oven to 325°F. To make the shortbread crust, mix flour, confectioner’s sugar and butter until fine like cornmeal; this can be done easily in a food processor with 10-15 pulses. Pat crust evenly into a 9-inch x 13-inch baking pan. Bake for 20 minutes. Wipe food processor with a paper towel, and during the last five minutes of crust baking, process the eggs, three tablespoons flour, granulated sugar and lemon juice thoroughly. Pour the mixture over the hot crust. Bake for 25-30 minutes until light golden brown. When cool, put confectioner's sugar in a fine mesh sieve and sift atop the lemon. Cut into squares and enjoy! Variation: add 1/2 to 1 teaspoon pulverized lavender buds to the shortbread crust. Lemon and lavender are a wonderful duo!